A lumbar medial branch block is a frequently performed procedure for diagnosing and treating pain in the lower back, hip, groin, and buttocks. Research has shown that inflammation and degenerative changes in the facet joints are responsible for about 10% to 15% of cases of chronic lumbar pain. Lumbar medial branch blocks help to reduce this inflammation in the affected nerves of the facet joints. A successful lumbar medial branch block also has diagnostic benefits. 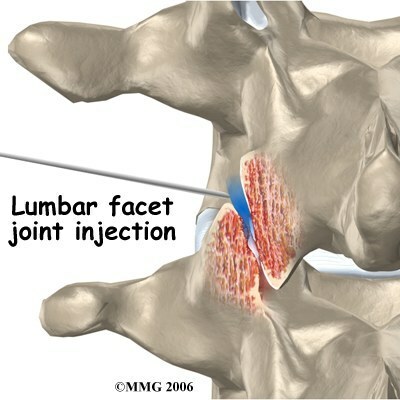 If the patient’s pain disappears after the injection, then it most likely originated from the facet joint. Depending on the results of the injection, doctors may choose to prescribe physical therapy, future injections, or a radiofrequency facet ablation (RFA). This procedure annihilates the medial nerves, blocking pain signals and resulting in prolonged pain relief. How is a Lumbar Medial Branch Block Performed? The patient is placed on an x-ray table and the skin is sterilized and prepped for the injection. If IV sedation is used, vital signs such as blood pressure, heart rate, and breathing will be monitored throughout the procedure. Once the skin is sterile, a local anesthetic is used to numb the area prior to the injection. Next, the physician injects dye and uses a special real-time x-ray, known as a fluoroscope, to guide the needle to the correct location. This will help deliver the steroid medication as closely as possible to the inflamed nerve root. The physician then injects a combination of anesthetic and a long-lasting steroid medication into the facet area. 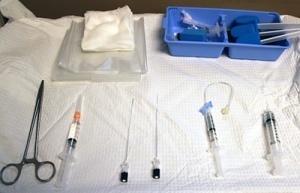 At the conclusion of the procedure, a band-aid is placed over the site of the injection. The procedure takes approximately fifteen minutes. The patient is monitored for approximately 30 minutes and provided discharge instructions when it is time to leave. Patients typically feel the pain relief benefits within a couple days after the injection. Current medical literature has supported the efficacy of lumbar medial branch blocks to manage facet joint-related pain. These studies have reported that this combination of powerful steroids and local anesthetic can have immediate and long-lasting pain relieving effects on low back pain. Several randomized, controlled trials have also documented the importance of lumbar medial branch blocks for diagnosing pain originating in the facet joints. In fact, current medical guidelines suggest the use of lumbar medial branch blocks in addition to imaging studies to help diagnose lumbar facet pain. Lumbar medial branch blocks are considered minimally invasive procedures; however, as with all procedures, there is some risk of complications, which include bleeding, facial flushing, nerve damage, insomnia, elevated blood sugar, and infection. Patients referred for lumbar medial branch blocks often show signs of facet degeneration caused by lumbar facet syndrome. The basic anatomy of the facet joints can help explain how this pain originates. The facet joints provide stability to the back during movement. The facet joints are about the size of a thumbnail, and they connect the vertebrae at the side of the spine. The facet joints are separated by a thin layer of cartilage and are surrounded by a capsule filled with synovial lubricating fluid. Medial branch nerves are located near the facet joints and are responsible for sending pain signals from that area to the brain. Patients with lumbar facet syndrome often feel pain in the lower back area that radiates to the buttocks and hip area. This pain is typically exasperated during movement, such as extension of the spine and during rotational movements. Lumbar medial branch blocks are routinely performed on patients with these pain symptoms, which often require additional testing beyond imaging studies to help identify the source of pain. Successful facet blocks relieve this pain and therefore confirm the facet joint as the source of the pain. Lumbar medial branch blocks play a key role in a conservative pain management program for lower back pain. Patients that benefit from this procedure receive pain relief that will improve function and quality of life without the need for invasive back surgery. The duration of pain relief varies with each individual; however, the procedure can be repeated or radiofrequency ablation may be done to help provide a sustained interruption of pain signals. Cohen S, Strassels S, Kurihara C, Forsythe A, Buckenmaier C, et al. Randomized study assessing the accuracy of cervical facet joint nerve (medial branch) blocks using different injectate volumes. Anesthesiology. 2010;112:144-152. Cohen S, Williams K, Hurihara C, Nguyen C, Shields C, et al. Diagnostic medial branch blocks before lumbar radiofrequency zygapophysial (facet) joint denervation. Anesthesiology. 2010;113:276-278. Lee C, Kim Y, Shin J, Nahm F, Lee H, et al. Intravascular injection in lumbar medial branch block: A prospective evaluation of 1433 injections. Anesthesia & Analgesia. 2008;106(4):1274-1278. 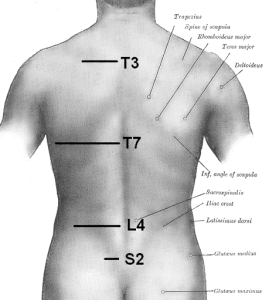 Massaia S, Nano G, Mammucari M, Marcia S, Simonetti G. Medial branch neurotomy in low back pain. Neuoradiology. 2012;54:737-744.